The new Siwertell unloader from Cargotec sets a new industry benchmark at 5,000tph (tonnes per hour); more than doubling current capabilities. Commercial ships make their living by transporting cargoes from one place to another — time spent in port loading and discharging does not earn any money. Ports and terminals like to see vessels turned round quickly to make good returns on their investment. Therefore Cargotec’s announcement of a new Siwertell high capacity screw type unloader rated at 5,000tph is very important news for the industry. Technical director for Siwertell, Jonas Andersson, says the new Siwertell unloader Siwertell VST 1090 has been designed primarily for the high capacity discharge of coal, and it is initially aimed at providing efficient, reliable, economical and environmentally friendly coal intakes for newbuild power generation plants in the far East. However,Andersson notes that for some dry bulk commodities, the new machine offers even more spectacular performance. “For certain bulk cargoes the new unloader will offer a discharge rate of 5,000tph, setting a new industry benchmark. “This is a very significant rate increase on previous models, but there is a lot more to this machine than a market leading performance figure. In common with all other Siwertell unloaders, it offers quiet, safe, environmentally friendly performance with little or no dust creation and no spillage. “Furthermore, this is a continuous rating; it applies irrespective of the depth of cargo remaining in a ship’s hold. In contrast, the high rates claimed for some grab crane systems are only valid at the start of discharge in each hold. As the level of the cargo falls, the grab must travel progressively further, incrementally reducing the actual discharge rate. Sometimes a new product can be developed largely by scaling up an existing machine; but this was not the case with the 5,000tph unloader. While it was possible to scale up some of the parts in the conveyor chain, the existing steel supporting structure design could not be adapted and so Siwertell designers had to develop a completely new solution. Another major challenge was dealing with the huge amount of material that has to enter the inlet head in order to achieve the target capacity. “Developing the new unloader was technically demanding,” explains Andersson. “The entire conveyor chain is new and there has been little re-use of our existing designs. “Because each delivery requires a bespoke approach to meet the customer’s particular requirements, a detailed design for an unloader is not possible until we have the necessary criteria to hand. Therefore our development work for the new unloader focused on the essential new parts for the screw-type unloader and detailed calculations for the new supporting structure. A high capacity unloader can only deliver its full potential when it is linked to adequate downstream infrastructure, and some existing terminal conveying systems may find it difficult or impossible to cope with the increased capacity. 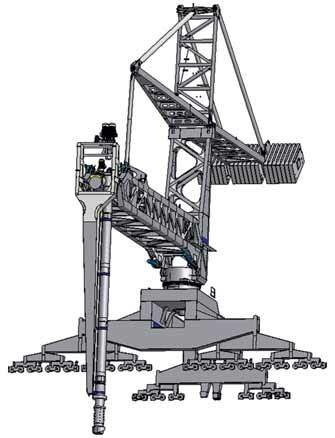 However, for new projects the quay conveyor and storage arrangements will be designed with a capacity to suit the specification of the unloader. Consequently, the new unloader is likely to find its first applications in new terminals, particularly for coal intakes feeding new power plants in the Far East. However, the potential economies of scale will also make it very attractive for those considering terminal upgrades? Managing director for Siwertell, Per Karlsson provides some persuasive figures to demonstrate the benefits of the new unloader; in this case when used for discharging coal at 3,000tph. “Cost savings can be achieved both in terms of initial investment and through-life operational costs, depending on the overall unloading performance required. Specifying two 3,000tph unloaders instead of three 2,000tph machines — to achieve a 6,000tph capacity — results in an investment saving of up to 25% in favour of the 3,000tph ship unloaders. “Alternatively, if the maximum possible capacity is required from the outset, then three 3,000tph unloaders will provide an unloading capacity of 9,000tph, as opposed to 6,000tph from three 2,000tph units. “Considering a Capesize vessel of 200,000dwt and a through- the-ship capacity of 65% the unloading time using three 2,000tph unloaders would be 51 hours. This would be reduced to 34 hours using three of the new 3,000tph unloaders. “With an annual intake of 6,000,000 tonnes per year, a vessel cost of US$60,000 per day and a working time of 22 hours/day, the annual cost saving should be in the region of US$1.4 million,” explains Karlsson. “Over the lifetime of the investment, say 25 years, the total saving should be around US$35 million, which more than justifies the higher investment costs for the unloading equipment, the conveyor belt and stacker. Additional cost savings will also be achieved in operation as there will be fewer operating hours for each unloader. “The new unloader will be heavier than its predecessors and this will naturally be reflected in the price. However, based on these figures, payback time should be less than three years, and that is without considering the additional savings in operation and maintenance costs.